A break in the stormy weather yesterday gave us a good look around at the avalanche carnage from Friday. As expected, many natural avalanches pulled out during the intense storm. They varied from large high elevation dry slab to low elevation wet slab. Many of the examples we saw were breaking at deeper layers and stripping the full depth of snow to the ground. Explosive triggers over the last 2 days were finding some disturbing results with many large full depth sympathetic avalanches. Today will start at CONSIDERABLE for all elevations and slowly get less stable throughout the day as another wave of precipitation hits from the South. Temperatures remain above freezing down low for the 3rd day in a row. Wind will pick up, reaching ridgetop speeds of 59-74mph tonight. 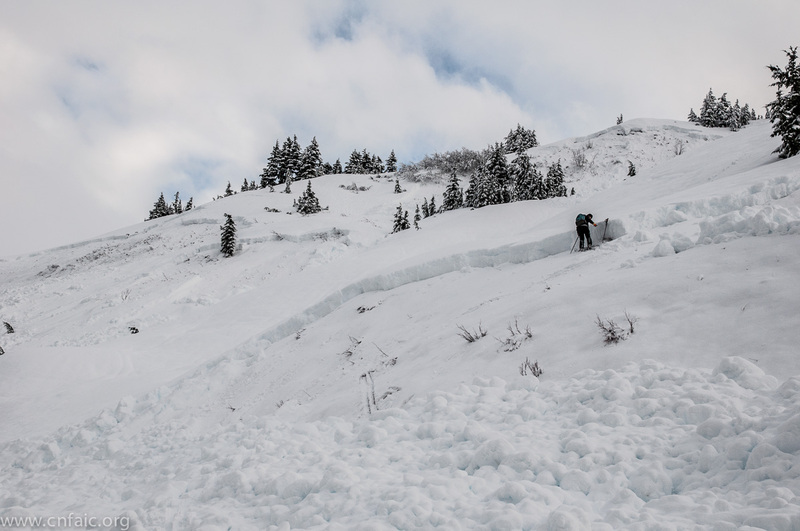 Human triggered avalanches are LIKELY today in steep terrain. Full depth releases are also likely if an avalanche is initiated, making the size unmanageable for people. This storm pushed us into a deep slab problem at higher elevations. This means that we now have average slab depths of greater than 1 meter sitting on top of a persistent weak layer. The avalanche implications are the same as we've been seeing, but the volume and destructive force have increased. With deep slab concerns a backcountry traveler will probably not see obvious signs of instabilty (whumphing, shooting cracks) until the slab actually avalanches. It is unlikely to be triggered at the deep points, but rather at the thinner edges near scoured ridges or exposed rocks. It may propagate large distances where it then pulls the deeper pockets. 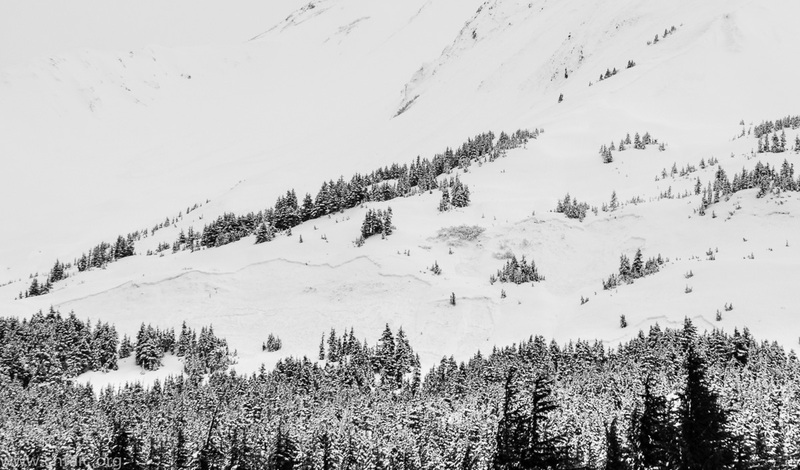 It may allow multiple tracks before somebody finds the trigger point and avalanches the entire slope. Deep slab is a low probability, high consequence problem. With continued precipitation, warm temperatures, and high wind - steep terrain should be avoided. When active weather abates the safe terrain options will get better with time. This photo is on Moose mountain, above Canyon creek. Below 2000 feet we had significant rain on snow on Friday. We can expect more rain today, perhaps as high as 1200 feet. The photos below show an example of the abnormal avalanche activity that can happen with rain and warm temperatures. This is fairly low in the Tincan trees. 3 distinct pockets released sympathetically on the steeper rolls as the weak layer collapsed. Debris from this was very dense. Tincan avalanche 1550 ft elevation. 200 feet high by 1000 feet wide. 2-3 feet deep. Friday's storm deposited over 2 feet of snow at high elevations and over 3 inches of rain or snow water equivalent at some low elevations. Saturday gave us a break in the storm, but temperatures did not drop significantly. Today, more rain and snow is expected. 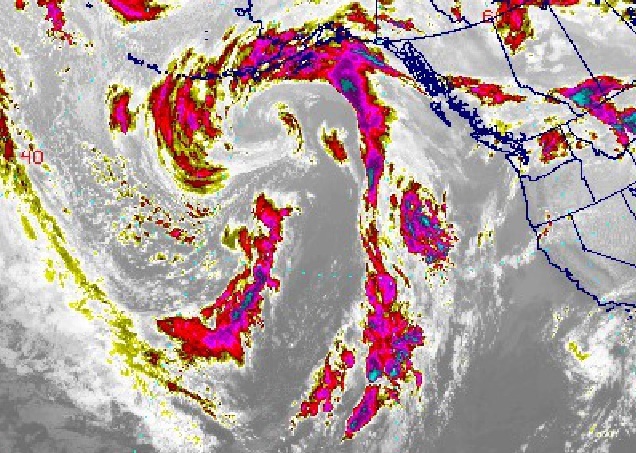 Another pulse of moisture is approaching from the south, originating at a deep 956mb low pressure center. Up to another inch of water is forecasted for the next 24 hours, with the bulk of that precipitation happening tonight. Temperatures will increase throughout the day, and snow level will rise from 500 feet to 1200 feet. Look for a southeast wind 51-74 mph, also increasing slightly as the day progresses. Expect continued warm temperatures through the week with more rain and snow possible.